Fashion's Sweethart: Are You Being Served? There is one thing that every little girl dreams of achieving when they "grow up". For some it's the pretty house, for others it's the real life doll, and for many it's a man who can fill your pretty house with pretty things. I may sound like a fifties housewife, or your grandmother but I am definitely one of these girls, and for me the thing I wanted most as a "child" and "adolescent" was a Chanel 2.55 Quilted Handbag. Yes i am now very aware that they cost thousands of dollars, and for someone whose current handbag is a $139 quilted faux leather tote, it may just be a little out of my budget. This week Queens Plaza, on Queen st in the city, cut the ribbon of a very special boutique; the first Chanel boutique to make it's way to Queensland. By lunchtime there was a cue to take a look inside as both shoppers and tourists anticipated the decadency that they would find inside. I watched from the side lines as an Asian lady tried on a pair of black suede leather court shoes and asked the shop assistant for a size larger. I watched as two young university students ooooooh-ed and aaaaah-ed at small gold key chains in the display cabinet closest to the counter. Luxury products aren't all that Chanel is famous for though. Customer service is very much associated with the luxury brand, and when you walk out of the shop with your little or slightly bigger package of decadence you feel exceptional, just as a customer who has walked out of an Apple store with a new laptop (cue applause). Unlike a computer though, you can wear your purchase on your sleeve and maybe your shoulder too. Chanel's customer service begs the question though, should we always be treated as number one when it comes to spending our money? After all your purchase is funding their company, keeping the sales assistant (and all other's involved in the process) in a job. There are those specific stores who have customers come in and the shop assistants immediately pounce on you, telling you you have a pretty dress or that there's some amazing sale on. These stores cause me to quickly divert my tour to another store. Then you have the stores where you are barely acknowledged and have to call out for some attention with a polite "excuse me" or "hello" on your end. Should we not, as the economy is pushing us to spend more and more of our hard earned money, expect a little more from our sales associates? 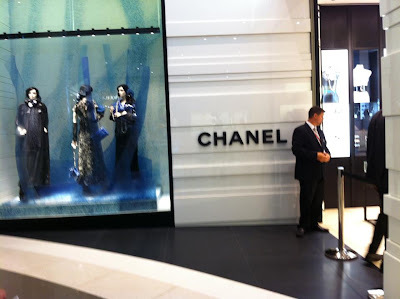 Next time the twenty-something yawning assistant pushes your needs behind the need to tell another assistant about her latest fling, walk out of the store and up to somewhere like Chanel, just so you can see what real service feels like.